It was the third day of our Southern Oregon long weekend and we were headed to Jacksonville! 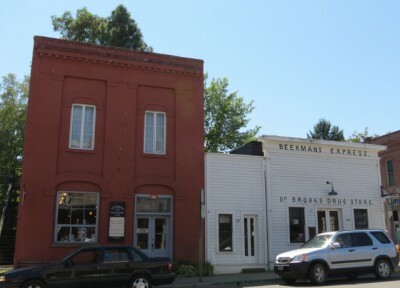 Jacksonville, Oregon is a historic town just 5 miles outside of Medford. It experienced a huge boom in 1851 and 1852 when gold was discovered there, and the town became the principal financial center for Southern Oregon at the time. However, the gold dried up, and so did the town, especially after the railroad passed it by in 1884. It remained the county seat until 1927, but the economy of the town drastically declined. As a result of the decline, progress bypassed Jacksonville and a large number of the commercial and residential buildings were left intact. Now the large number of historic buildings are the stars of the town, drawing tourists to the quiet downtown. The main street is lined with shops, selling a variety of art, local clothing and handmade jewelry, and fair trade products. Jon and I visited in 2011, and loved the relaxed little town so much that we couldn’t wait to come back. 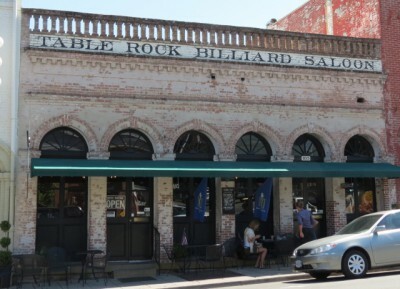 We had lunch at the Bella Union – a restaurant in a historic building downtown. The Bella Union began as a restaurant and saloon in 1864, and operated until it burned on April 14, 1874. After that it was home to many businesses; a machine shop, saddle shop, saloon, deli and finally a restaurant and saloon once again. 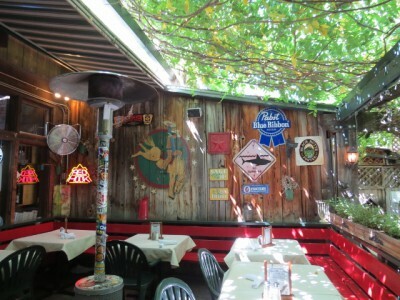 The present restaurant has been in business since 1988. I had a turkey cranberry sandwich and vegetable soup; Jon had steamed clams and salad. Both were delicious. We sat outside on the patio in the warm shade and enjoyed a relaxed conversation with Jon’s parents. After lunch, we shopped a bit, and then headed off for our next adventure – wine tasting! Once we had toured the Oregon Caves, it was time for lunch in the historic Oregon Caves Chateau! The Oregon Caves Chateau was built in 1934, in order to provide the tourists visiting the cave with lodging and meals. The Chateau was designed and built by Gust Lium, a local contractor with no formal training. His talents were recognized by the Forest Service, and he was responsible for several projects within the Siskiyou National Forest in Southern Oregon, where the Oregon Caves are located. The Chateau is six stories tall, built over a steep ravine. The location makes its appearance a bit misleading, because when viewed from one direction, you can see all six stories, but from the front entrance, only the top three stories are visible. The Chateau has 23 guest rooms, and also houses a dining room and coffee shop. In front of one of the entrances to the coffee shop is a courtyard with a pond. 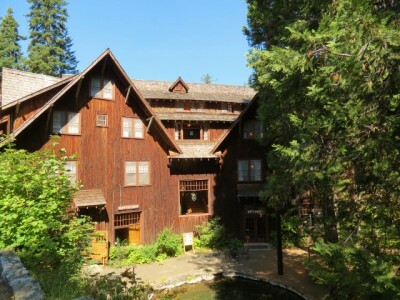 The style is considered National Park Rustic, with cedar siding on the exterior of the building, giving it a shaggy appearance. Inside, the Chateau has the largest public collection of Mason Monterey furniture, made by the Mason Manufacturing Company in the 1930s. Much of the furniture is in original condition, although some has been restored. Although we didn’t stay at the Chateau this time (one day I will! 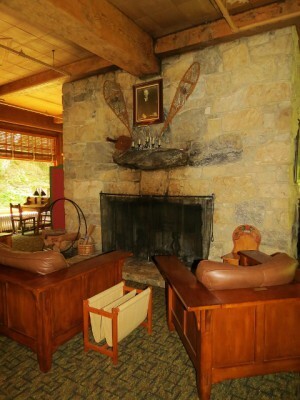 ), the rooms all maintain their original appearance, with steam heaters, and no telephones or televisions. Some people would call this dated, but I appreciate the intention of making sure there are places that stay true to history. But this post is about the coffee shop. It was completed in 1937, with birch and maple counter tops on a counter that snakes around the dining room and vinyl stools, and it is almost entirely original! The knotty pine paneling is original, but the oak parquet floor that was constructed in the 1930s had to be replaced with a tile floor after a 1963 flood. We were there for a late lunch, so it wasn’t that busy when we got there and we were able to get 4 stools all together. 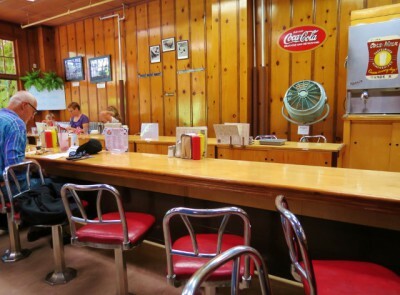 They serve typical diner fare with a Northwest twist, but their signature items are the milkshakes and malts! They make them from real, hard ice cream and there is a long list of flavors that you can choose from. I am a purist, so I went with the chocolate. Each milkshake is huge, arriving in a full glass that is as big as the stainless steel cup it is made in. YUM! 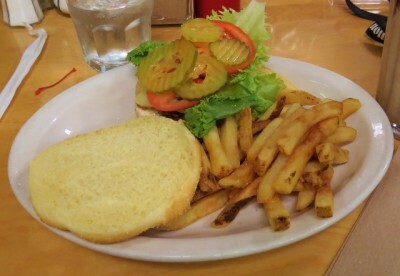 I ordered the bison burger, which was perfectly made (I asked for mine medium rare) and fries. Jon had the Chef salad. They have a variety of other burgers and sandwiches, chili, chicken strips and meatloaf. Although the menu is pretty heavy on the meat, there are some vegetarian options, as well as a vegan burger. And you can substitute a gluten free bun on any of the burgers or sandwiches. My buffalo burger and fries! I really enjoyed just sitting on the stool, eating my burger and shake and chatting with Jon and his parents. It was a real treat to enjoy a meal in this historic setting, and it reminded me that we need to take the time to just slow down and see and experience what is right in front of you. Have you stayed at the Oregon Caves Chateau or dined there? 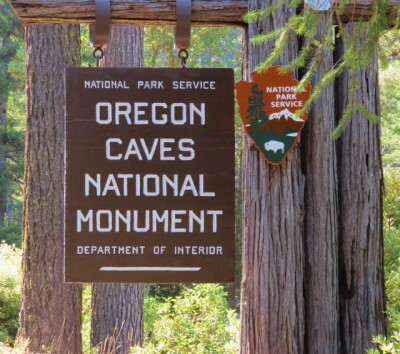 Oregon Caves National Monument – A Rare Marble Cave! Did you know that only 5% of the world’s Caves are made of marble? And we were lucky enough to visit one of them on our trip to Southern Oregon! One day of our trip was devoted to a visit to the Oregon Caves National Monument. I have been wanting to visit for a long time, but when we made our way through the area on our California Road Trip in March 2013, it was too early in the year, and the cave tours hadn’t started yet. And when we passed through on our way home from our California Marathon Road Trip in December 2013, it was too late, and cave tours were done for the year! Tours run April through October. This time I was finally going to see it! I was so excited about our visit to Oregon Caves National Monument! The cave itself is made up of about 15,000 feet of passageways. The stone was original limestone that formed about 190 million years ago; gradually the limestone metamorphosed to the marble that it is today. Although the rock is old, the cave itself is thought to be only between 1 and 3 million years old. I say that like I have any concept of something that is over 1 million years old! Like many “explorations” of the time period, a cave exploration in the 1890s created a significant amount of destruction, breaking off stalactites and stalagmites, widening passageways by destroying cave formations, and sometimes dynamiting new passageways altogether… Add to that the numbers of early tourists who wrote their names on the cave. Ugh… Fortunately, the carnage mostly stopped in 1903, when President Theodore Roosevelt designated the forest around the cave as a National Forest. On July 12, 1909, Oregon Caves National Monument was protected by President William Howard Taft. Because of the caves isolated location, only about 1,800 people visited in 1920. After roads were constructed, tourism increased, but it wasn’t the easiest place to get to. In 1934, the Oregon Caves Chateau was constructed, a six story, 23 room hotel built into the side of the mountain. The chateau allowed people to stay at the site, rather than having to travel all the way from Grants Pass to the caves and back in one day. I’ll tell you about our tour in my next post! Even so, Oregon Caves National Monument is still relatively isolated, about an hour from Grants Pass and up a long, winding and often narrow road. It is 20 miles east of the small town of Cave Junction, Oregon. The monument is open all year long, but cave tours don’t occur in winter, and the road is occasionally closed due to snow. As a result, annual visitation is only estimated to be 80,894. I’ll tell you about our visit and cave tour in my next post! 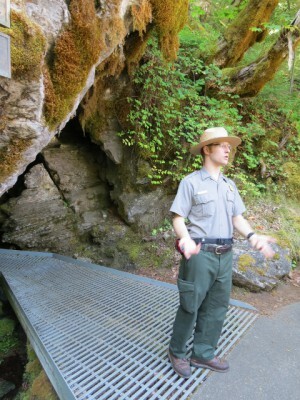 Have you visited Oregon Caves National Monument? How did you enjoy your visit? Jon and I prefer vacations with variety, and who doesn’t love a little shopping? I have to admit, I don’t shop for clothes very often, but I was able to start out our August long weekend with a little shopping at Oregon’s Woodburn Premium Outlet Mall. Jon and I got a jump start on our vacation by driving down to Woodburn after work on Thursday evening. Our final destination was Grants Pass, Oregon, so driving to Woodburn allowed us to get more than halfway there. We stayed at the La Quinta nearby, which is frequently our home base when we go wine tasting in the area. After getting some breakfast with Jon’s parents (they ended up at the La Quinta too! ), we made our way to the Outlet Mall. The Loft was having a clearance sale and I spent awhile there, exploring the clearance rack and trying on several things. I made out like a bandit, getting two dresses, several pairs of shorts and tops, and two sweaters. I topped off my shopping with a new pair of Naturalizer wedge sandals with cork soles, and a cozy Columbia fleece. Jon found a couple of things for himself as well; a jacket, a long sleeved running shirt, and a new watch. After the outlet mall, we had a quick lunch at Subway, and then continued on towards Grant’s Pass. We wanted to stop along the way at a few wineries that we had never tried before, ones that were reasonably close to the freeway. I found one that was right off the freeway in my Oregon winery book, Sienna Ridge Estate. 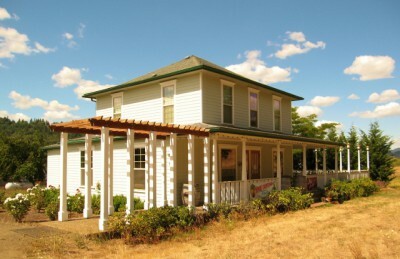 The Sienna Ridge tasting room is located in a historic home built in 1906. Sienna Ridge’s vineyards are also unique, as one of the only individual vineyards to be designated as its own AVA, Red Hill Vineyard. We made the short detour, only to find it… closed for an event. Foiled! Sienna Ridge Estate – Closed! We got back on the freeway for a few more exits while I consulted my book again and decided we would try out Palotai Vineyard and Winery. Neither of us had ever heard of it before, so we weren’t sure what we would find. The winery is a tiny little place tucked down at the end of a long gravel driveway with four acres of vineyards on either side. The tasting area is the front of the wine production facility and warehouse, with a small covered area in the front with barrel tables. The server ran us through a tasting of four wines. I didn’t take notes, but they were all good. 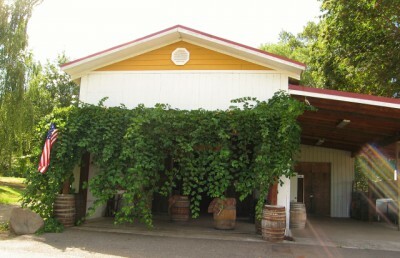 The winery was owned by a Hungarian gentleman who had fled Communist Hungary in the 1980s. He started out training horses in Sacramento, and then eventually began making wine using European methods. He made small batches of wine that are drinkable right after bottling. We stopped for some groceries and then found our rental for the weekend and got settled in. The house was huge, with a hot tub and a pool. 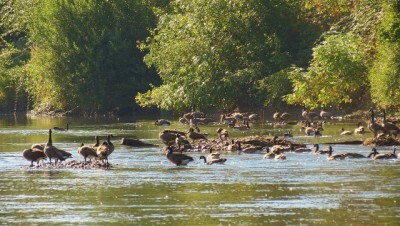 We enjoyed a steak and salad dinner on the front patio overlooking the river, and watched the Canada geese flying back home from their daily feeding grounds. And we got to check out the jet boats on the river! It was a great end to a wonderful first day of vacation! While we were down visiting family in Portland in May, my cousin and I decided to do an afternoon of wine tasting in the Willamette Valley. After Megan and I visited Chehalem Winery, we headed to another winery in McMinnville: Walnut City WineWorks. Jon and I had visited a few years before, at the recommendation of Jon’s grandfather, and they had some really good wines, so I was excited to try them again. Walnut City WineWorks is a custom crush facility that provides a production facility for several wine labels: Walnut City WineWorks, Bernard Machado, Carlton Hill, Z’IVO, Lundeen, Genius Loci, and Robinson Reserve. What makes Walnut City WineWorks different is the fact that they are actively involved in vineyard management for the various labels, and all the labels are sold in the tasting room. The Walnut City label produces about 6,000 cases per year, and when you combine all the labels the production is about 12,000 cases per year. They are located in a historic brick building right near downtown McMinnville; I’m sure that it used to be an industrial facility of some sort. It has been nicely renovated with a modern and tasteful decor, although it is a bit dark inside. We also tried the Z’IVO Charly, which is a blend of 75% Gewurztraminer, 20% Pinot Gris and 5% Viognier. Again, I thought the wine was a bit too sweet, but Megan loved it (she declared it to be her favorite) and went home with two bottles. Next we tried the 2012 Walnut City Rose, a Pinot Noir Rose made in the Old World style. It was dry and crisp and absolutely delicious. The 2011 Walnut City WineWorks Willamette Valley Pinot Noir is the largest production at the winery, with 4,000 cases produced. It was bright and tart, with a light mouthfeel and a soft, elegant structure. I really enjoyed it, but it is certainly a very delicate Pinot. We also sampled the Bernard-Machado 2007 Pinot Noir. Our server explained that this wine is only produced in years of great grapes, which was confusing to me because I have heard that 2007 wasn’t such a fantastic year in Oregon Pinot – the cool, wet season led to wines that are much softer and more delicate than other years – characteristics in Pinot that I personally love, but not everybody does. This wine exhibited more of the earthy, forest floor flavors, and it was good, but not outstanding, and it didn’t warrant the $36 price tag for me. The Walnut City WineWorks 2008 Pinot Noir Reserve was more up my alley. Spice, black cherries and cola dominate this wine that was barrel aged for 18 months and bottle aged for another 24 months. It won a Gold Medal at the Great Northwest Wine Competition, a new competition where the judges aren’t professional tasters, but rather people working in the wine industry in Washington and Oregon. We finished off our tasting with a Lundeen wine, the 2008 Rogue Valley Syrah. The grapes are sourced from the Rogue Valley in Southern Oregon, which has hotter, drier summers and and is known for growing the hot weather grapes. That said, this Syrah is nicely balanced, and was described as a Syrah for Pinot lovers. The flavors of blueberry and blackberry are accented by just a hint of dark chocolate. Megan and I thoroughly enjoyed our visit, but of course I didn’t think to take any photos. We did take some wine home with us – we got a case between us and the server was kind enough to allow us to ring the orders separately and still apply the discount. If you have a chance to visit, you won’t be disappointed. And be sure to let me know what you think! Tonight I’m drinking a varietal I’ve never tried before. Jon and I were down in Seattle a few months ago and stopped in one of the downtown wine shops. We were perusing the selection, and we decided to each select a reasonably priced wine that we had never tried before. This was my pick, for $15.99. I opened the wine without looking up anything about it first – I wanted to try it without anything affecting my perception first. The nose is a light, toasty butter, and it is a nicely balanced mix of crisp minerality and butter. It reminded me a lot of a Pinot Blanc. After googling Auxerrois, I learned that it is a grape similar to Pinot Blanc (yay for my tastebuds!) and is also the grape used in French Chablis (I might have to buy some Chablis now). Elemental Cellars is the side project winery of Steven Westby, winemaker for Witness Tree Vineyard. The grapes are sourced from Zenith Vineyard, which sells grapes to some of the best known Willamette Valley wineries, including Adelsheim, Ponzi, and St. Innocent. Apparently this block of Auxerrois is the oldest in Oregon. I haven’t tried Witness Tree Vineyards wine either, but after tasting this wine, I will have to make sure to try them too at some point soon.